I tried answering as many construction questions about the armor and staff as I could. (I had to take off the headdress/wig a couple of times when it got too heavy and oppressive. Something in the front of the headdress is digging into my forehead --enough to leave a welt there--so I'll have to put some padding over that part.) The staff turned out really well. It was a bit wobbly, but I wanted to keep it hollow so it wasn't too heavy to carry around all day. I regret I didn't get that many pictures, even though I had remembered to bring my camera this time. 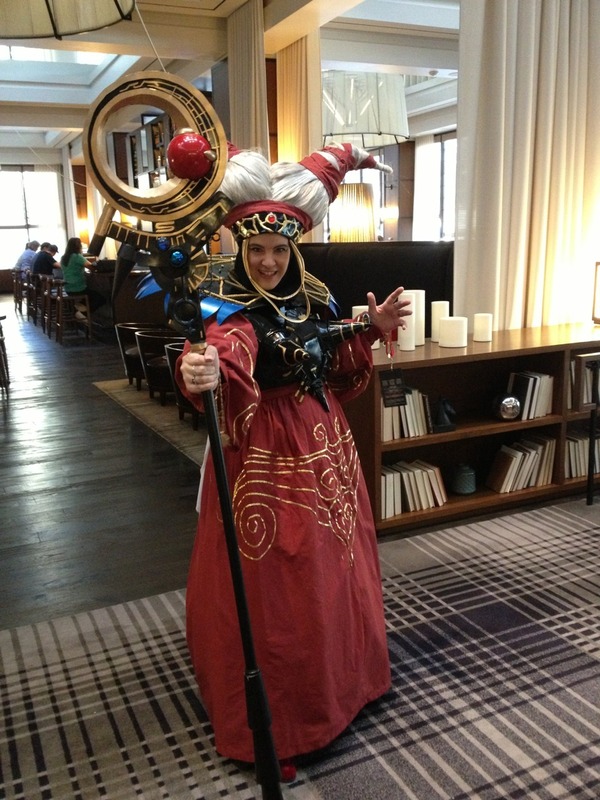 I did record a few segments for Lewis' show in the Rita Repulsa costume, which hopefully turned out well. Once I got back home, I spent an entire day trying to set up and format my new, larger harddrive since I figured it was about time I did that. (The smaller harddrive I bought after the Crash just doesn't have enough room for all of my files and programs.) I don't have a smartphone and didn't have e-mail access throughout most of the weekend so I kind of fell off the face of the earth for awhile. I DID manage to save my e-mail archives and transfer them without losing anything this time, and I even got my Mailwasher software to work, although I'm not a big fan of the new tiny-lettered interface. I'll keep the smaller, 40g harddrive I've been using and use it if/when this new harddrive fails. Which it hopefully won't for awhile.